I live in a very small apartment and so, I am always looking for ways to minimize the amount of things we have. One of my favorite ways to do this is by having multiple-use items. 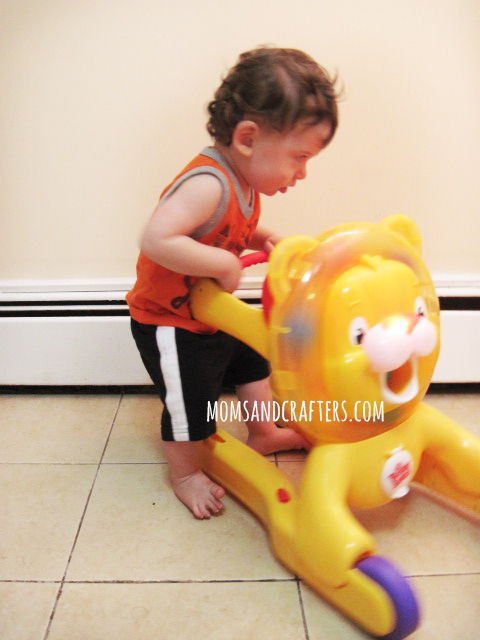 The Bright Starts Step n Ride Lion is a walker that converts to a riding toy. It is also a fun toy to play with on its own, by placing the balls in the lion’s mouth, and watching the reaction. The assembly was super easy, taking under five minutes. 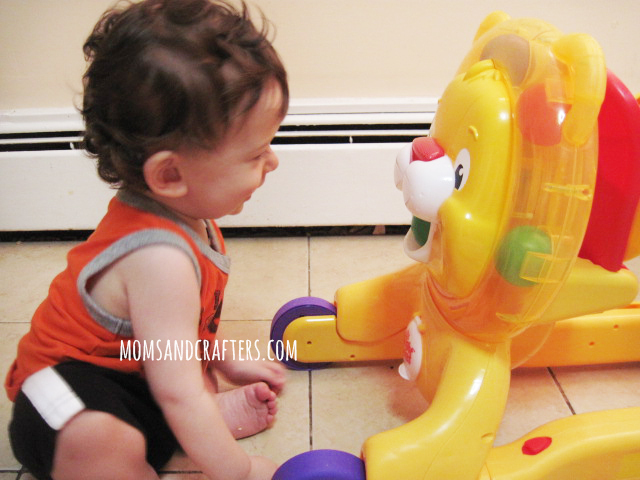 My baby right away liked the bright face of this friendly lion. 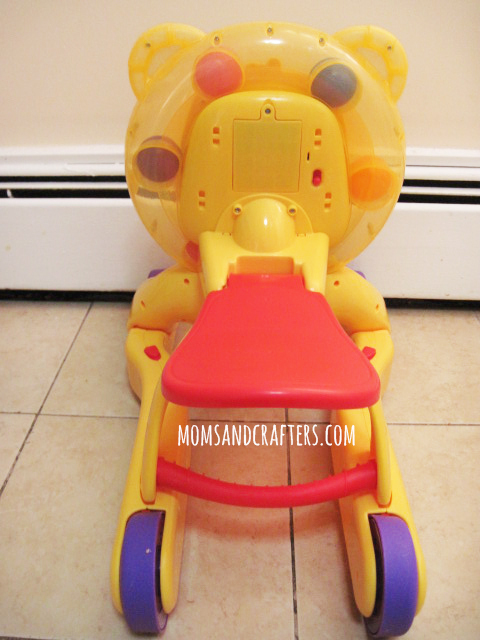 It looks sturdy and durable, which is important in a toy that takes baby through a few milestones. 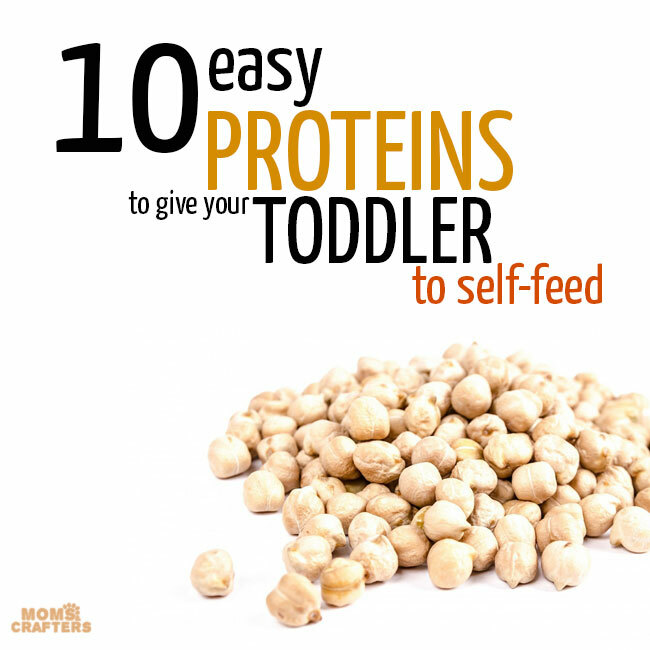 It’s especially important in this one as it’s an active toy. 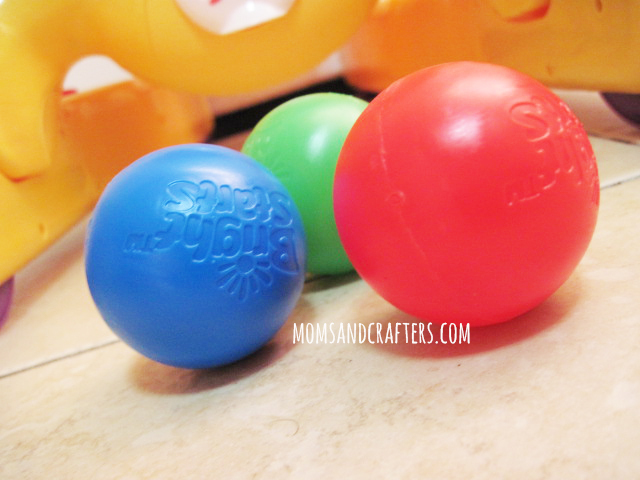 It comes with very few balls – only three, which I guess is because it’s not the main purpose of the toy. You can purchase more balls separately. For me, it’s really not an issue as they are the same balls as the Hide n Spin Monkey. 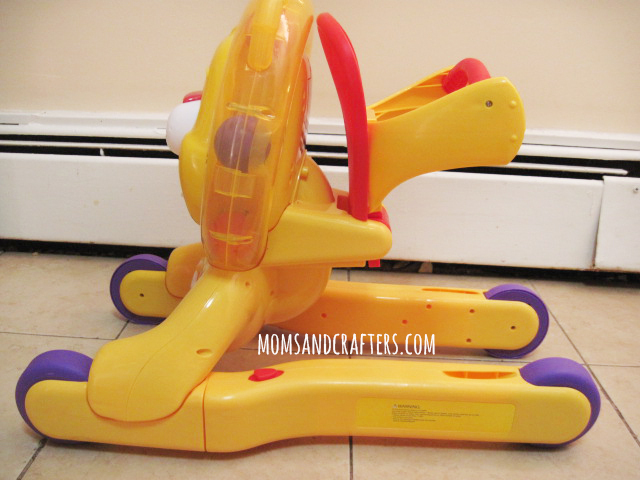 Converts easily from riding toy to walker using a small latch so you can use them for both stages at once. 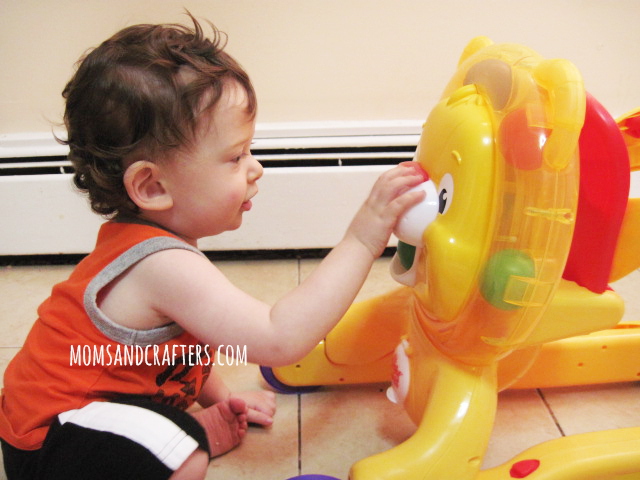 Place balls in Lion’s mouth to make music and lift up door to find them. 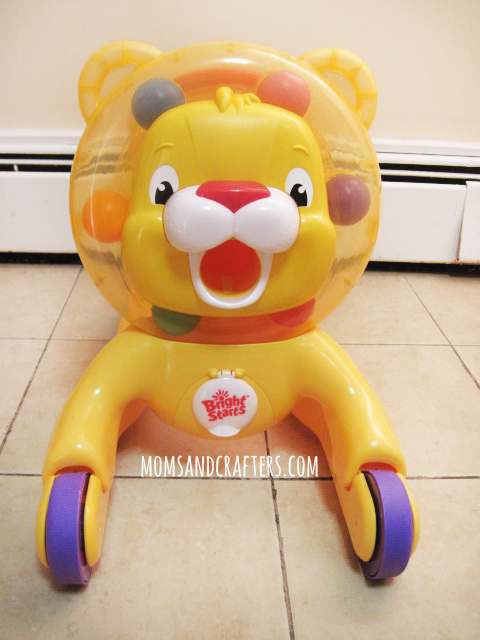 Press lion’s nose for more lights and music, plus the balls will spin in the lion’s mane. Two volume levels, plus volume off in case you want some quiet time. I love the versatility of a three in one toy, as I’ve mentioned above. I’ve also mentioned that it feels strong and durable. I like that it plays music when baby walks or rides. That is currently what is motivating my baby to take his first steps holding on. He sees the reaction on the lion and so he tries again. It’s great that you can turn that off, as I can imagine how annoying the sounds can get when baby learns to zoom about the house with it. My baby loves the balls and the interactions. He chases after them and then throws them around. He even tries to crawl under the couch to retrieve them. 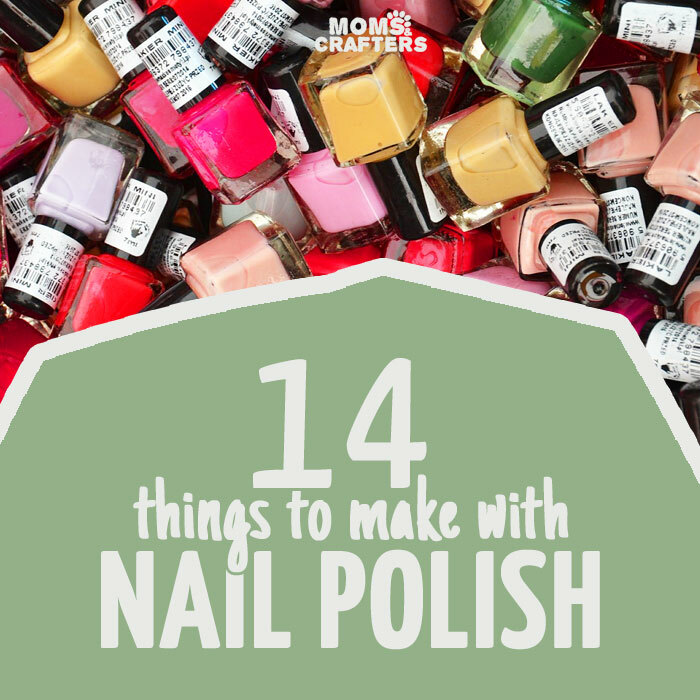 They are a great distraction from the kitchen cabinets! He is able to put the balls in these much better than the monkey – I guess it’s more within his reach at this stage. I’ve seen riding toy – walkers in the past but I’ve never seen one that converts this easily. While the idea is usually that babies will first learn to walk, and once they’re done with that, can ride, it’s not always so. My family tends to have late walkers, and often they are riding before they walk independently which means they’d be using both modes at once. 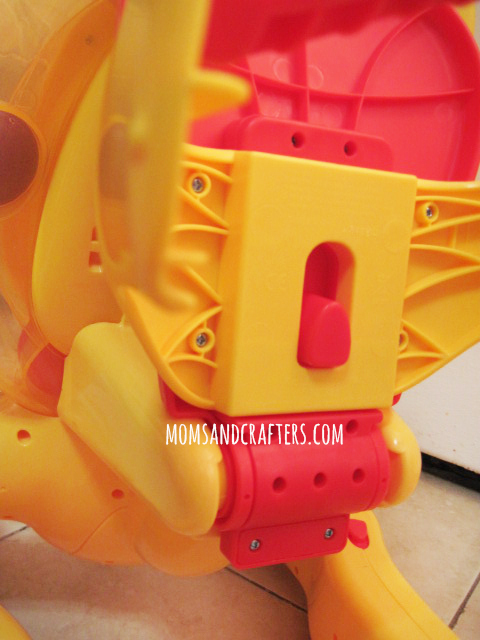 The fact that this toy converts so easily makes it a leader in the industry. I do have a couple of issues with the walker mode. 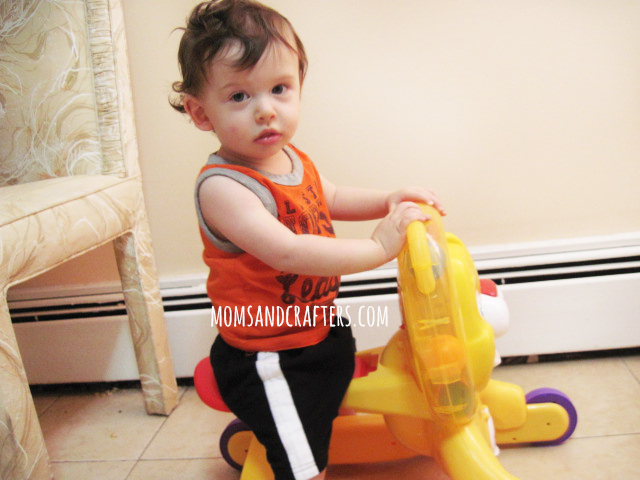 Firstly, the wheels reach far backward, making it difficult for a very beginner walker. My has almost no control and is really just starting to learn, and they got in the way. In addition, it’s a bit short for him. While it’s possibly only slightly shorter than most walkers, my baby is very tall. Most walkers will be too short for him, however, the inch less on this was a bit too much. That being said, he does seem to enjoy using it occasionally – it just doesn’t engage him as much as it can. In addition, as I’ve mentioned with the monkey, I’d love if there was somewhere to store the balls! Of course, that would be an extra, as most toys in the industry don’t necessarily come with parts storage. Babies who love animals. 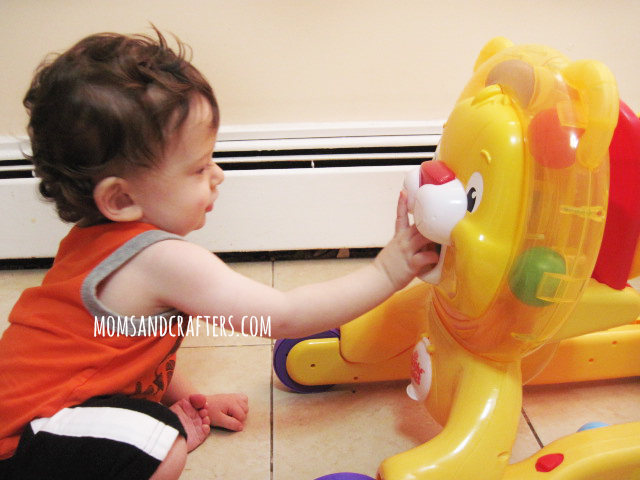 My baby has been like this since one month old, and I see how much he loves looking at the lion’s face! 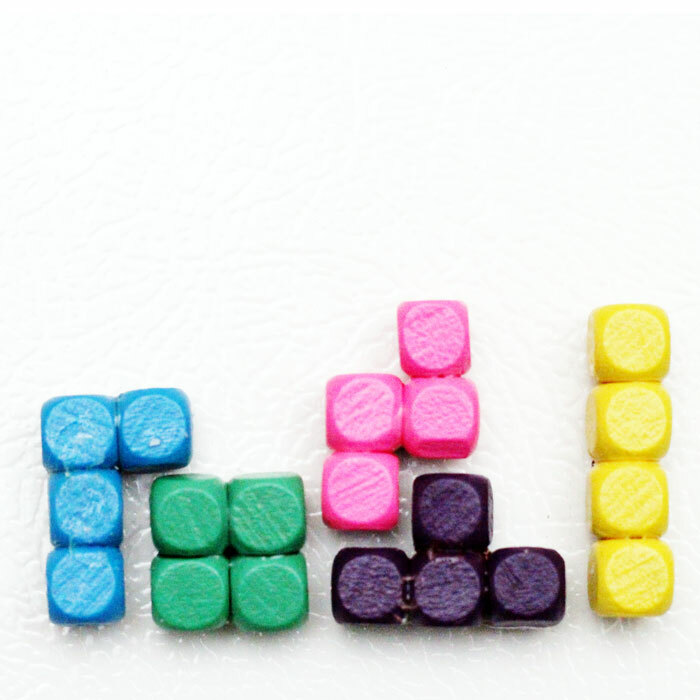 People with smaller budgets who are looking to buy fewer items with more use. Final Score is 4/5 stars. This toy is so amazing, it’s hard not to love it. I just wish there was a way to move the wheels slightly out of the way in the walker mode so it would be easier to use in the early walking stage. Other than that it is a great, versatile, engaging toy. 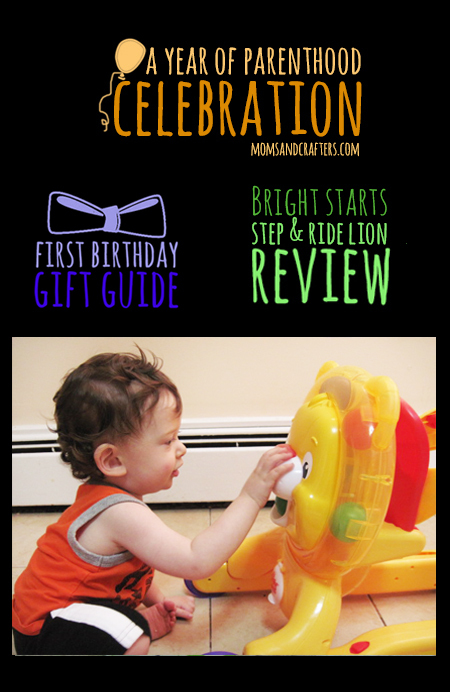 Purchase the Bright Starts Step n Ride Lion Here! I really love this toy . I like the multiple ways it can be played with. What a amazing toy for a young child to have. 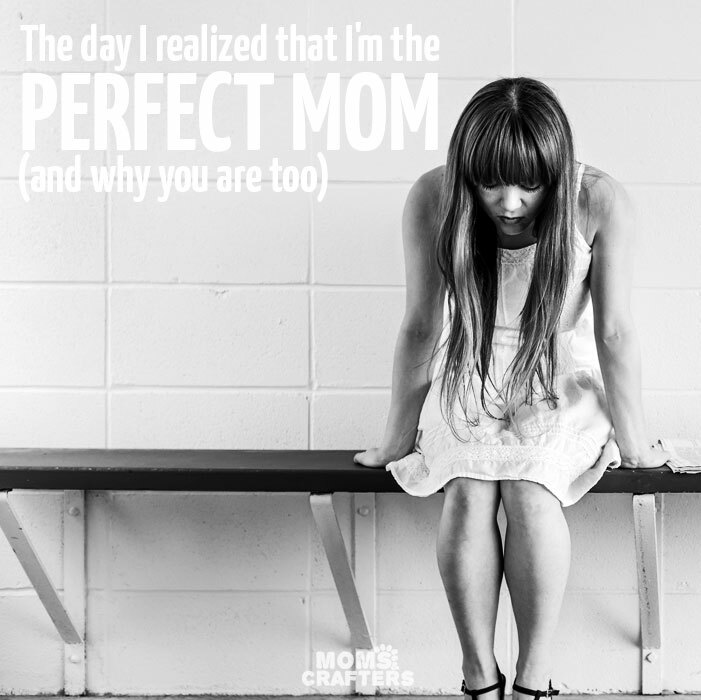 I love that this grows with your child. It’s nice that you can get more play out of it. So many baby items are outgrown in a few months. I love learning toys and this one is super cool. Any child would just love to play and learn with it. I love that it has lights and sound. Perfect gift for a 1 year old to enjoy.